Which brings me to a little trick: when looking for info about a recipe, turn to the experts. Search in the language of the area the food originates in, then just hit the little translate button. You can get an app from google and install it on your search bar. Soak overnight and cook, then spread out to air dry. Dry roast them, stirring now and then and don’t crowd the pan. Season hot out of the oven. I, of course, in a typical brash and bold American style corrupted the simple recipes I found with a few touches of my own. I went a little wild, flavoring these with whatever came to mind. I’ve made them with Curry, Adobo, Cajun, and my favorite so far, Jo Jo Spice! Giving the still warm Garbanzos a quick spritz of cooking spray allows the spice blends to stick without any sogginess. 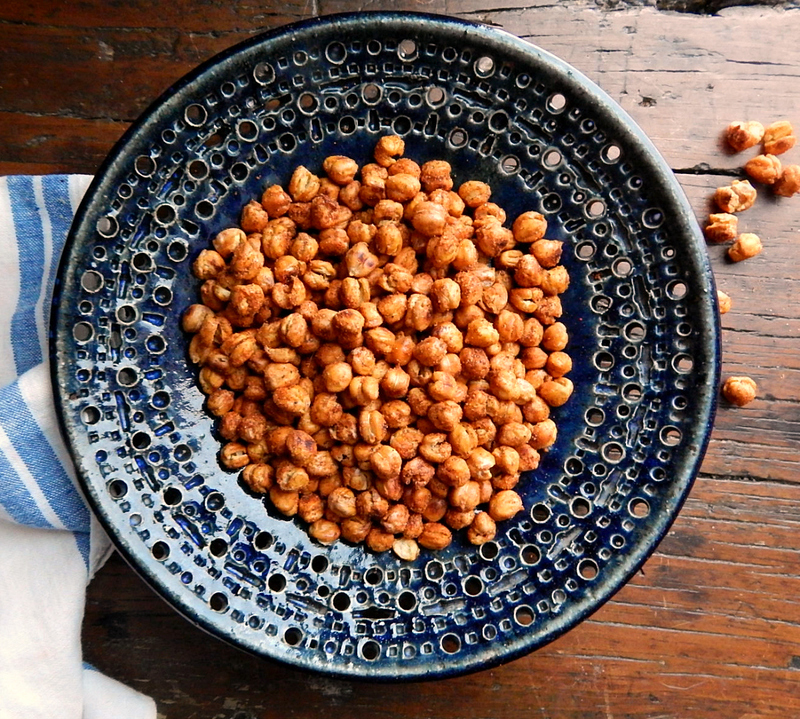 A plus of using the dried Chickpeas? They’re fabulously frugal! This is a marvelous way to finish up a pot of leftover chickpeas, too. Oven roasted like this, they’ll keep for weeks so there’s no worry about waste. Pull out your pressure cooker if you have one to cook the peas. And if you don’t have one, why not? And by the way, the only way I’ve found to “save” all the recipes that become soggy because they’re roasted with olive oil? Fry them. Soak Chickpeas overnight, cook according to package directions, drain and allow to dry. Spreading them out on an absorbent kitchen towel and rolling them around can help to facilitate the drying process. Preheat oven to 400 degrees. Line a large baking sheet (or two) with foil, for easy clean up if you wish. Spread the dried chickpeas out. This is best done if the peas are not crowded. Roast, stirring every now and then and rotating the pans front to back, top to bottom about halfway through. Watch carefully towards the end – ovens vary in temperature and intensity. The timing in mine was about 45 minutes total, but this might vary by a lot depending on your oven, how crowded the pans are and what type of pan you use. When the peas are still warm, spritz very lightly with oil, then sprinkle heavily with the spice of your choice. Carefully roll the chickpeas around in the spice mixture, taste, add more of your spice if needed. Chickpeas may also be salted at this point. Store in an airtight container. These will keep for weeks and weeks but the flavoring may dull a bit with time. This entry was posted in Click here for Fabulous Food Posts and tagged Appetizer, Chickpeas, Dried Beans, Easy Recipe, Frugal Hausfrau, Legumes & Pulses. Bookmark the permalink. Of course, here in India, we love Chickpeas. And right now I am cooking a pot with white chickpeas to use in salad, make Kaddalah, and a couple of other dishes – and one of those is going into my own Blog 🙂 🙂 :). Will make yours as well, later! Thanks. 🙂 thanks; they’re so much fun to eat. I love chickpeas – this sounds great! At the risk of repeating myself, I love chickpeas. I had a salad yesterday when I was in London, puy lentils, chickpeas, fennel, tomato and avocado. Manna from heaven. It sounds wonderful! I have never had the puy lentils; I think we have to get them off Amazon, but I’m crazy about any lentils. I think I should do a bunch of lentil recipes now that it’s fall!